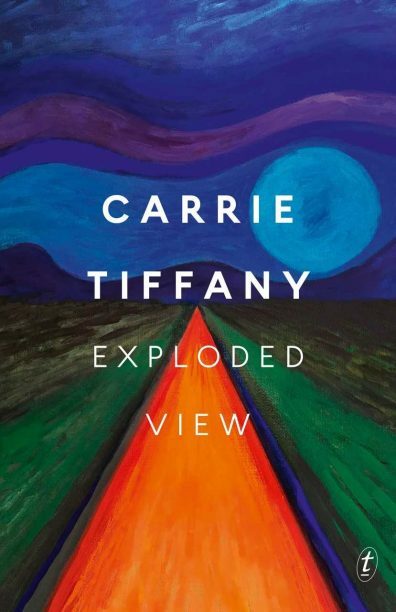 The name of Carrie Tiffany’s third book, Exploded View, refers to the type of diagram found in technical manuals that shows the spaces between each individual part and how they fit together to make a whole. This concept also describes the novel perfectly: a seemingly simple book where it appears that not much happens on the surface, instead, everything happens in between the complicated gaps. The unnamed first-person narrator is a teenage girl, possibly on the autism spectrum, definitely troubled—she refuses to speak. Possessing a deep affinity for cars and a sound knowledge of their mechanics, she has enough know-how to be an effective saboteur. The story takes place over a short period, most of which is a family road trip from the western side of the Australian continent to the east coast. Her constant inner monologue is a mixture of odd preconceptions and keenly intelligent observations, paired with a deep ambivalence towards the tyrannical ‘father man’. She might be young, and at his mercy, but the reader eventually learns that she isn’t entirely powerless. Tiffany’s previous novel, Mateship with Birds, divided readers between admiration and dislike, and this novel will do the same. She is an author who makes her readers work hard—but she always elicits a response. Whether liked or not, this is a powerful book and can’t be ignored.